192 x 128 mm. – 134 leaves, with 12 large penwork initials, 3 large decorated initials, and 12 pages of canon tables. Four Gospels, in Latin, c. 900-925. 12 large penwork initials, 3 large decorated initials, 12 pages of canon tables. 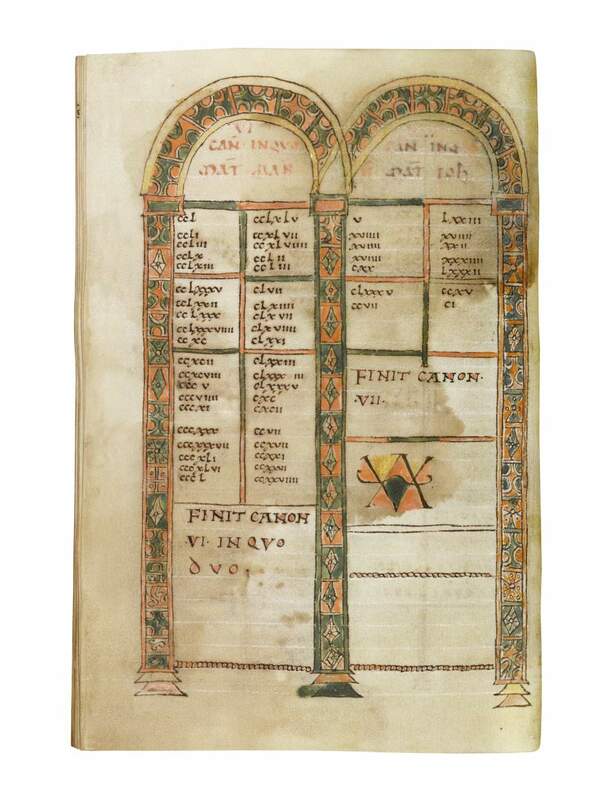 This rare Gospel Book made in 10th century Brittany contains lovely penwork initials and colourful canon tables. Gospel books contain the four accounts of the life and death of Jesus Christ. In the second half of the first century, these were thought to be authentic accounts by Matthew, Mark, Luke, and John translated from Greek into Latin. The Gospels have always been the central text of Christianity, which is why they have been especially cherished throughout the ages. In the Catholic tradition, priests would only handle the codex with cloaked hands, as the sacred could not be touched with bare hands. The gospel book represented the Word of God and consequently the Saviour. Even today it is of pre-eminent importance in Christian liturgy. Breton manuscripts from this period are distinguished by unpretentious decoration, using pen drawings filled with washes rather than precious colours and gold. Surviving examples of manuscript production from Brittany are extremely scarce. This work is now in the collection of the Museum of the Bible in Washington, D.C.